Happy Monday! 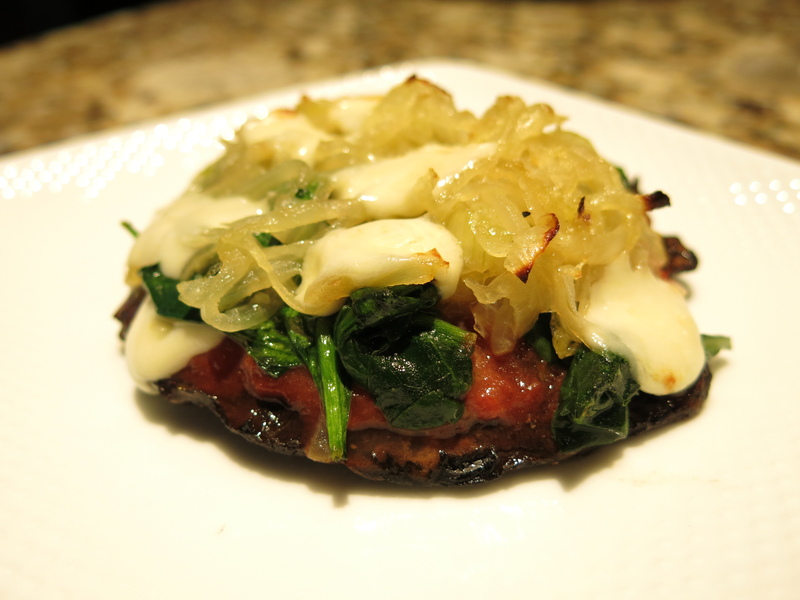 I write with a recipe today: Portobello Pizzas! It’s another of my gluten-free creations. Even five years ago I don’t recall hearing much about problems that gluten can cause, and it turns out there’s a reason. According to research by the Mayo Clinic, celiac disease (an immune reaction to eating gluten that can cause severe abdominal pain and diarrhea) is on the rise, now affecting one in every 100 people. Even if you don’t have the full-fledged disease, you might still have a sensitivity to gluten, causing you to experience problems like loss of energy, acne, and various gastrointestinal problems. No one in my family has a gluten problem, but I do try to reduce the amount of wheat in our diets where I can because I find that it’s just too easy to eat the stuff. It seems to be in absolutely everything. As I’ve mentioned elsewhere, I can’t help but wonder: are more people suffering from gluten problems precisely BECAUSE our consumption is on the rise? Consider it food for thought. I must have had this in the back of my mind when I saw the portobello mushrooms because I immediately thought “pizza crust substitute”! So I combined the mushrooms with caramelized onions, sauteed spinach, tomatoes, and mozzarella to create the recipe you see below. If you’re looking for a quick weeknight meal, you’re going to need to bypass the caramelized onions. But if you have some time on your hands, they are SO WORTH IT! The key to making them properly is “low and slow.” Like so many other good things in life, they can’t be rushed. For this recipe, I sweated them out for 35 minutes, but truthfully they could have used another 10 minutes to develop the rich caramel color that gives them their name. If you don’t have the time to invest in this adventure, DO NOT rush it by cranking up the heat. You’re destined to brown or burn them. Go low and slow, and you’ll be rewarded with the sweetest onions you’ve ever tasted. Ones that are so soft they practically melt in your mouth. I’m salivating just thinking about it. If you don’t have the time or patience for this, just substitute the caramelized onions for another favorite pizza topping. This recipe calls for fresh mozzarella cheese. It does NOT call for reduced fat or – gasp – fat free cheese. Like many things food-related, I have strong feelings on this subject: if you enjoy cheese, you should eat cheese, by which I mean REAL, full fat cheese. Yes, cheese does have a lot of fat, but we need fat in our diets. Among other thing, it helps our bodies absorb vitamins and minerals in the foods that we eat. That said, you shouldn’t go overboard on fat consumption, particularly if you suffer from heart disease or are looking to trim down. This recipe calls for just 1.5 ounces of mozzarella per serving. And a serving here is TWO rather large mushrooms. You will be more satisfied with that 1.5 ounces than with three times the amount of yucky fat free Kraft singles. Heat 1 tablespoon of olive oil in a saute pan over medium heat. Add the sliced onions and ½ teaspoon of salt, stirring to coat the onions in the olive oil. After 2 minutes reduce heat to low. Allow the onions to sweat for about 35 minutes, stirring every 2-3 minutes to ensure they do not brown. The onions are done when they are quite soft and a light caramel color. While the onions cook, set the broiler to high. Gently remove the gills from the mushroom caps with a spoon. Rinse the mushrooms and pat dry. Brush the mushrooms with 2 teaspoons of olive oil and sprinkle with salt and pepper. Place the mushrooms on a cookie sheet or shallow baking pan, lined with aluminum foil. Broil the mushrooms for 6 minutes on each side. Remove the mushrooms from the pan. Turn off the broiler and set the oven to 450 degrees. Heat the remaining teaspoon of olive oil in a saute pan over medium-low heat. Add the spinach, garlic, and a dash of salt and saute, stirring constantly, until the spinach wilts and the garlic is fragrant (about 2 minutes). Line another cookie sheet or shallow baking pan with aluminum foil. Transfer the mushrooms to the pan and layer them with equal amounts of the toppings: tomatoes, spinach, onions, then cheese. Bake for 5-7 minutes, until the top of the pizzas just begin to brown.